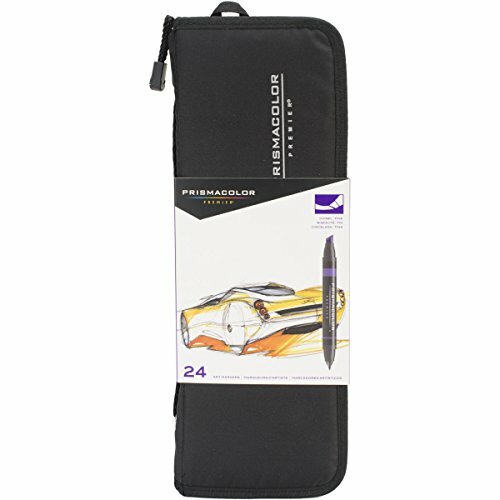 Prismacolor Double-Ended Art Markers 24/Pkg-Assorted Colors by Sanford at Stickman's Blog. MPN: PM97. Hurry! Limited time offer. Offer valid only while supplies last. Every artist can appreciate these double-ended art markers. The ink is formulated to give the richest color saturation with silky smooth coverage. Every artist can appreciate these double-ended art markers. The ink is formulated to give the richest color saturation with silky smooth coverage. The duality of the thick and skinny tips let you change it up whenever the mood strikes. One ink source ensures color consistency from either end. It's an alcohol, dye-based ink that's non toxic. Canson Infinity Rag Photographique 210g 17"x22"